Strut Records have announced they will be releasing a major and brand new retrospective of one of the towering figures of the music of the Caribbean: the calypsonian Mighty Sparrow. The album ("Sparromania: Wit, Wisdom and Soul from the King of Calypso 1962 - 1974") will be released in January 2012. During a career of over 40 years, Sparrow has been an unmatchable figure in the world of calypso and a constant backdrop to Caribbean life, recording over 300 albums and winning eleven Calypso Monarch and eight Road March titles at the annual Trinidad Carnival during one of the most competitive times in its history. Scoring his first hit, ‘Jean And Dinah’, aged 20, Sparrow’s style drew on influences from US street harmony quartets to crooners like Nat King Cole, jazz greats – Ella, Sinatra – and the early calypso generation including Lord Melody and Lord Kitchener. By the late ‘50s and in his early 20s, he was already an influential figure, encouraging Trinidad’s people to pay taxes with Carnival hit ‘P.A.Y.E.’ and highlighting cruelty to animals on ‘Russian Satellite’. This new collection hones in on Sparrow’s most creative years as he effortlessly surfed musical styles from calypso party jams to hard-hitting boogaloo and soul. He had become a confident political commentator, tackling subjects as varied as domestic economic hardship (‘Ah Diggin’ Horrors’), slavery (‘The Slave’) and the Cuban missile crisis (‘Kennedy And Kruschev’). Other tracks serve as a vital reference point for today’s music. On ‘Picong Duel’, we hear Sparrow and fellow calypso legend, Lord Melody, trade insults, a direct forerunner to later mic battles in hip hop culture. Elsewhere, Sparrow just plain rocks the party (‘Calypso Boogaloo’, ‘Jook For Jook’) and turns in the odd choice cover – we feature here his lilting version of Otis Redding’s ‘Try A Little Tenderness’ with Byron Lee. 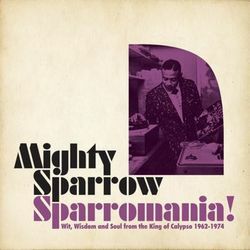 The album also documents Sparrow’s fearsome live reputation with two firing tracks from a late ‘60s gig at the Barbados Hilton and excerpts from a ‘70s concert in Brooklyn featuring Sparrow’s dynamite backing band, The Troubadours, at the peak of their game. The double-CD has 26 tracks in all with an extra couple on the digital download ("Warm and Tender" and "Big Bamboo"). 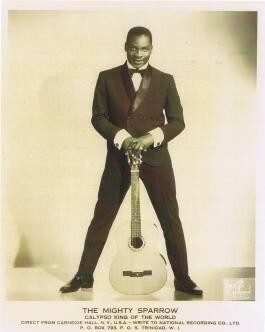 WIT, WISDOM AND SOUL FROM THE KING OF CALYPSO 1962-1974"